And Hosni Mubarak spoke today for the first time as a convicted defendant in court in the retrial of the killing of the protesters. Now this was not a defense presented to the court by already convicted person who can spend the rest of his life in jail. This was actually a speech by a president to the public. It was emotional speech where he spoke about how much he gave to Egypt , how he served this country whether in Armed forces or in presidency. He claimed that he had never ever given an order to kill any Egyptian. He also said that he had never visited Israel which is inaccurate because he had a short visit during the funeral of PM Rabin in 1995. He said that he conquered terrorism during his term and the current administration would beat terrorism as well. He spoke about that plot against Egypt..etc. He spoke boldly and shamelessly about his constitutional amendments claiming that his era was era of freedoms. His speech reminded me of his emotional speech he said on 1 February 2011 , in fact I wonder who wrote it for him. Just like on 1 February 2011 in Tahrir square , Pro-25 January Egyptians in social media had one answer to this speech : Their shoe. 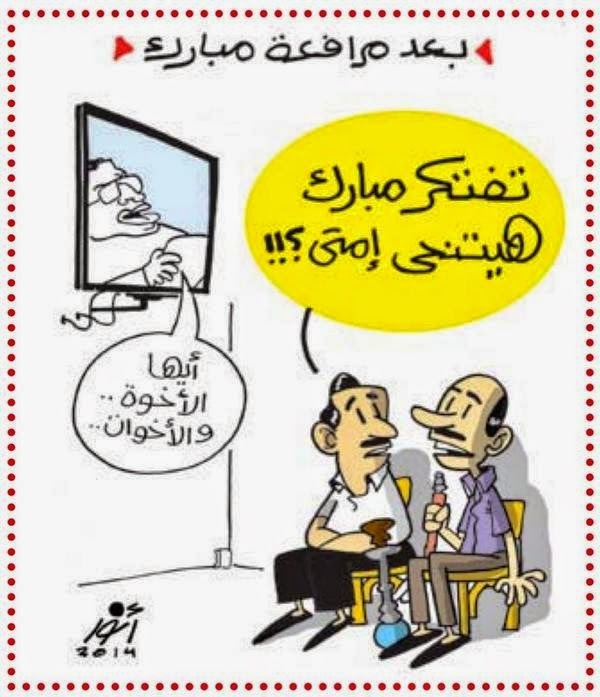 Here is a cartoon about Mubarak's speech today by Anwar. Two men on a cafe watching Mubarak when he would step down. It is worth to mention that Mubarak spoke once publicly in a leaked recorded message that was aired on Al Arabiya in 2011.So technically this is the second time for him to address public not the first. Of course the first time he was a fee time while the second time he is a standing a retrial while he was already convicted in a previous case. Habib El-Adly spoke for the second time in the court for hours. Technically his speech was like that “Bla , bla , bla ….25 January is not a revolution ; bla bla bla bla 30 June is revolution but 25 January is not a revolution; bla bla bla bla … the Americans and the Muslim Brotherhood planned this conspiracy to bring down the state”. He technically repeated what he said last time but added new details attacking ElBaradei and Wael Ghonim especially ElBaradei. He also said that the regime was following his security policies in tougher way admitting that he supported the decision to cut the telecommunications on 28 January. He even compared such decision with the decision of the armed forces to block the telecommunications in Sinai. El-Adly said that the characteristics of revolutions do not apply to 25 January because it wanted to topple the regime and the state !! Of course I am not expected the longtime state security officer to understand that revolutions normally topple regimes and bring down failed dictatorship states. Nevertheless in his speech El-Adly one thing which is true. He said that the state’s apparatuses and institutions had to recognize the 25 January as a revolution but they know it was not a revolution only for political reasons. This is true the Egyptian state’s apparatuses and institutions do not believe the 25 January revolution and fought it actually but they had to recognize it for political reasons in order not to anger the public and not to anger the West as well. Back to El-Adly’s theatrical speech ; well with the amount of religious reference used in that speech today one must wonder if the former minister of interior is going to work as an Islamic preacher after the trial !! Personally I believe that Mubarak and the rest of his cronies will be acquitted in that trial considering how the Pro El-Sisi media is preparing the public for this by defaming the 25 January revolution for months now. Already I think that our regional patrons including UAE and Saudi Arabia want Mubarak to be acquitted. Of course some may say that won’t happen because El-Sisi can not afford acquitting Mubarak in that particular case but yet again those some are the same ones who claimed that he would amend the Protest law and pardon the Pro-Democracy and Pro-Revolution activists imprisoned because of that law and nothing happened. El-Sisi is a military man and so he takes decisions without considering any backlash or public opinion as long as he believe it is right from his point of view. By the way for all those who are speaking respectably about the great former President Mubarak should remember that he was convicted officially in a corruption case and is serving three years. He should be in jail for corruption charges and stealing the public’s money in the Presidential Palace case. The court will issue its final verdict in September by the way. Thank you for this report, Z. He might be acquitted!? Does that mean he might get out of jail once his three years for corruption are done? Are his wife and kids free? Question to ask is why Egypt, Libya, Iraq or Syria were far better off when they were fully under dictatorships of Mubarak, Gaddafi, Saddam and Assad. What good did toppling the dictators achieve? Nothing. "Dictators" in the Middle East allow more freedom than the culture and religion of the people allows, that's why they are needed. Tunisia is a superior place to Egypt. It is also better than western dictatorships were in their heydays. Belief in freedom through slavery is a drug. this is the stress test for al Sisi. 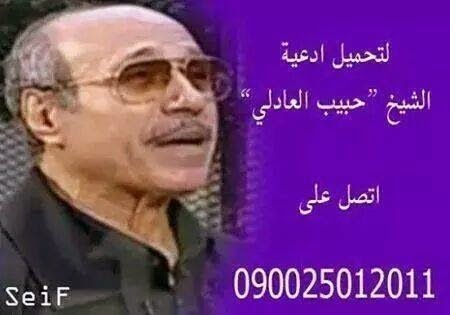 If Mubarak walks free, we know that the felool have returned.